Exercise as we know has many positive benefits, but too much can be harmful. Children who exercise compulsively are at risk for both physical and psychological problems. Compulsive exercise (also called obligatory exercise and anorexia athletica) is an exercise addict's frame of mind. He or she no longer chooses to exercise but feels compelled to do so and struggles with guilt and anxiety if he or she doesn't work out. Injury, illness, an outing with friends, bad weather — none of these will deter those who compulsively exercise. In a sense, exercising takes over a compulsive exerciser's life because he or she plans life around it. In sticking to a rigorous workout schedule, they seek a sense of power to help them cope with low self-esteem. Eventually, compulsive exercising can breed other compulsive behaviors like strict dieting and obsessive thoughts about perceived flaws. Exercise addicts may keep detailed journals about their exercise schedules and obsess about improving themselves. Unfortunately, these behaviors often compound each other, trapping the person in a downward spiral of negative thinking and low self-esteem. That's psychological issues but there are plenty of physical issues that can result as well. Lifting too heavy of weights could shift growth plates and have other issues on the normal growth of bones. 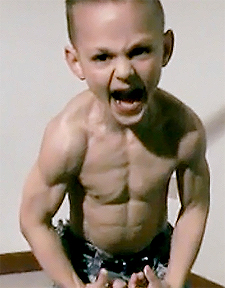 Actually becoming overly muscular at too young an age will have a negative effect on the muscle size ratio to the bone size, and the bones will not be able to properly catch up. Overall, if your child is going to lift weights, it’s never too early to start working on form. -And If they really want to, instruct them to go high reps, low weight. At 13 is when they should start pushing themselves a little more. • Well-Written (Original) Essay: Yeahh, it was pretty good. • Appropriate / Relevant Pictures: Yupp. • Formatting (Text & Pictures): Picture was good. • Recommendations for making the essay better (spelling, grammar, pictures, facts, etc. ): Could have written more and got more in detail. • How did the essay change your views about the topic? Pretty interesting. Recommendations for making the essay better (spelling, grammar, pictures, facts, etc. ):a little more detail. How did the essay change your views about the topic?I didn't know that their could be psychological problems. Recommendations for making the essay better (spelling, grammar, pictures, facts, etc. ): more facts would be nice.